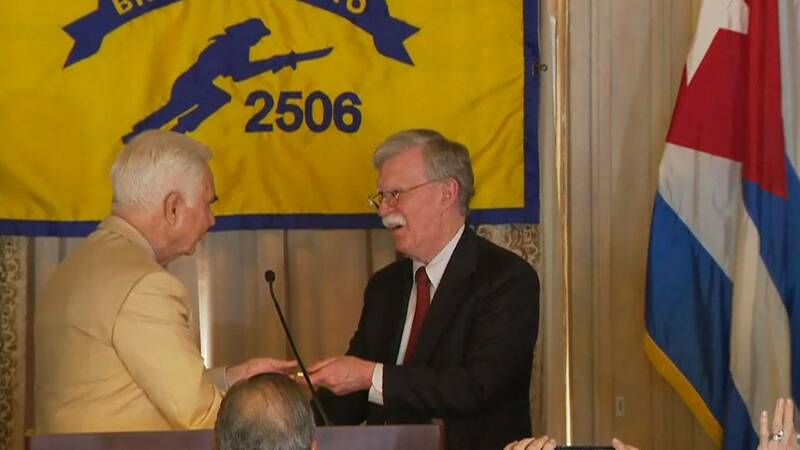 CORAL GABLES, Fla. - During a Bay of Pigs veterans' luncheon at the Biltmore Hotel in Coral Gables, National security adviser John Bolton announced Wednesday that President Donald Trump is toughening his policy on the "troika of tyranny," referring to Venezuela, Cuba and Nicaragua. 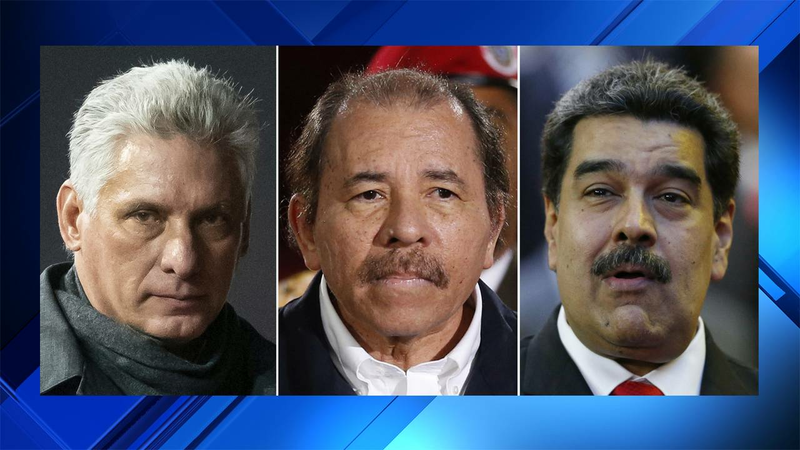 Bolton said to a round applause from Cuban exiles, including Rep. Mario Diaz-Balart, that the "three stooges" of socialism -- Nicolas Maduro in Venezuela, Miguel Díaz-Canel in Cuba and Daniel Ortega in Nicaragua -- are on their way down. Bolton said that what is left of socialism in Cuba and Nicaragua will tumble after Venezuela is freed. He announced the U.S. Department of Treasury will be issuing sanctions against the Central Bank of Venezuela as a "strong warning to all external actors in Venezuela including Russia." "We must all reject the forces of socialism and communism," Bolton said. Bolton was critical of former President Barack Obama's policy on Cuba and said Trump was going to correct the stance that he believes contributed to the decline in Venezuela. The Monroe doctrine, which makes the U.S. responsible for the hemisphere's stability, "is alive and well," he said. "The destinies of our nations will not be dictated by foreign powers; they will be shaped by the people who call this hemisphere home," Bolton later wrote on Twitter. The U.S. will also be issuing sanctions against Nicaragua's Bancorp and Laureano Ortega, who Bolton accused of corruption. Bay of Pigs Veteran Juan "Johnny" López de la Cruz gives John Bolton a gift Wednesday at the Biltmore Hotel in Coral Gables. Bolton had lunchwith members of the Bay of Pigs Veterans Association to mark the 58th anniversary of the botched U.S.-backed invasion. During his speech, he also said Trump will never abandon Cuban exiles and freedom fighters, as Trump is determined to finish what the Bay of Pigs veterans started. "Our nation and this region are forever in your debt," Bolton told the Cuban veterans. Bolton's speech comes after Secretary of State Mike Pompeo announced that he won't be getting in the way of the use of U.S. courts to sue companies that use property that was seized in Cuba during Fidel Castro's revolution. 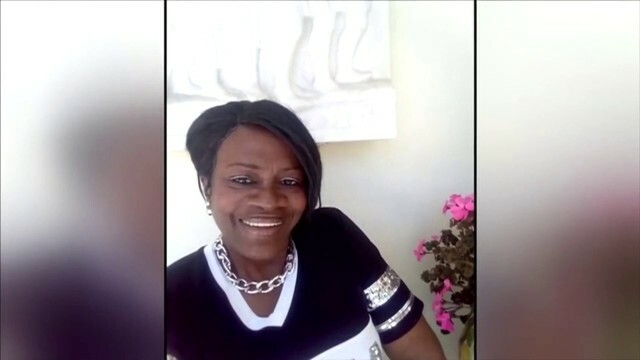 Starting May 2, attorneys will be able to file lawsuits that apply to about 200 Cuban businesses and government agencies that are already subject to U.S. sanctions because of their ties to Cuban military and intelligence ministries. From left, Florida Gov. 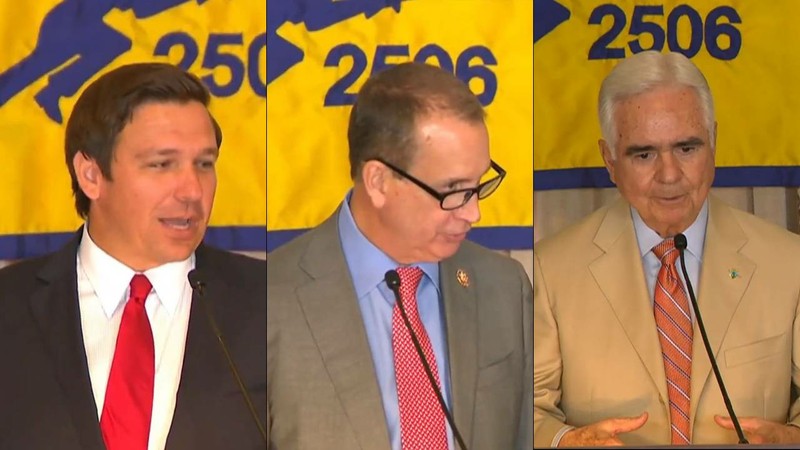 Ron DeSantis, Rep. Mario Diaz-Balart and Bay of Pigs Veteran Juan "Johnny" López de la Cruz spoke during the anniversary luncheon Wednesday in Coral Gables. Rick Wilson, who is the senior vice president of external affairs and corporate responsibility for Bacardi, was at the Biltmore. He said the announcement is of big interest to the company, which has long fought for the trademark being used by the Cuban government. Bay of Pigs veteran Juan "Johnny" López de la Cruz, the president of the veterans association, also praised Trump's decision. Florida Gov. Ron DeSantis, U.S. Attorney Ariana Fajardo Orshan, Miami Mayor Francis Suarez and Miami-Dade County Mayor Carlos A. Giménez were also in attendance at the luncheon. After the announcements, Emily Mendrala, the executive director of the Center for Democracy in the Americas, released a statement saying the Trump administration is "doubling down on isolation and, in so doing, causing great pain to the people of Cuba" and U.S. businesses. Cubans on the island were concerned about the limitations that Bolton announced on remittances and travel. Cuba's Foreign Minister Bruno Rodríguez reacted to Secretary of State Mike Pompeo's announcement on Twitter. "I strongly reject Sec. of State Pompeo announced activation of Title III of Helms-Burton Act. It is an attack against International Law and the sovereignty of Cuba and third states," Rodriguez wrote. "Aggressive escalation of US against Cuba will fail. As in Giron (Bay of Pigs), we shall overcome."